Children age 3 through grade 5. It is the hope of the Parish Religious Education Programs that each child will become one who prays, loves, acts with justice and is nourished by faith. These areas of prayer, love for God and neighbor, morality and justice, and faith, should be developed within the child's faith life. 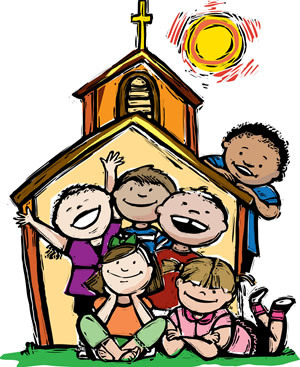 "Religious education must involve the student (family) in his/her faith community's liturgy... It teaches, it forms community, it forms the individual." (NCCB, "Basic Teachings for Catholic Religious Education"). Something New For Our Parish Children! Pew Art Cards: Parents, give your young children a "Pew Art Card" with a colored pencil (located in the Church Vestibule) so they can draw a picture about God, Church or Mass. Their drawing is a form of prayer and their creativity is God's gift. You can place their drawing into the collection basket as their unique offering to God. Please return the colored pencil as you leave Church. "I Feel Good When I Thank God" envelope for older children, also located in the Church vestibule. Goal: This participation in the offertory will help our children feel like they too have an important role in Mass. The presence of our children is God's gift to our Church.